Well, the eve of the release of the new Daredevil #1 is a perfect opportunity to return to the blog after an intense period of traveling and moving into a new apartment. In between stuffing most of my belongings into moving boxes, I did manage to squeeze in watching Jessica Jones on Netflix though, and will return to that in my next post. The short version? I thought it was really impressive. For now, let’s get to the first issue of Charles Soule and Ron Garney’s Daredevil! While I’ll try to keep outright spoilers to a minimum, I recommend that you read the issue before reading further. My first thought when I saw the preview for this issue a few days ago was that it had a distinct retro feel to it. We see a crowd of up-to-no-good thugs watching Daredevil dive off a bride in pursuit of their latest victim, and they reminded me of the kind of bad guys you’d find in an old issue by Miller, or even Chichester. The script – and the artwork, for that matter – has a classic feel to it that in no way feels derivative, but appears to draw its inspiration from a very different era than the one we’ve grown used to over the last few years. Of course, as you read the issue to completion, you realize that the “standard thugs” are anything but, and you instantly know what Soule was talking about in his blog post regarding the villains of his coming run. “Creepy” seems an apt description. I’ll admit to being very intrigued. Retro elements aside, this issue brings plenty of news that will probably take a while for longtime readers to make sense of. 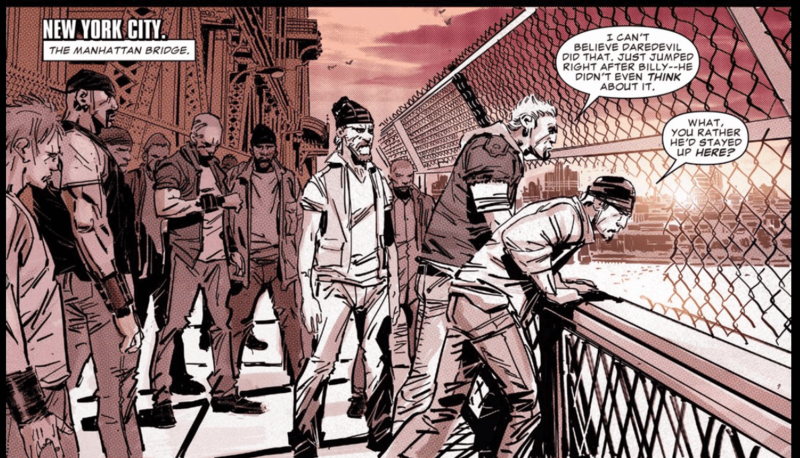 New characters abound – Blindspot makes for an interesting addition thus far – and the only character (aside from Matt himself) that we recognize from previous runs is Foggy, though his relationship with Matt is clearly not what it once was. In their conversation, there are hints to some kind of large-scale mindwipe (though it may be something else entirely) that I suspect will worry some readers, and as far as I’m concerned it’s too soon to tell, or even try to guess, what’s going on here. This is part of what makes this issue so difficult to review. It’s one thing to judge the merits of a single issue or story – and in this regard, the creative team does a fine job (more on this below) – and quite another to decide how you feel about events and developments that are still shrouded in mystery, but will ultimately decide how the story is meant to be understood within the bigger context of all that has gone before. I’m not actually the kind of fan who obsesses about canon, and for that reason I actually prefer something that comes closer to a clean reboot which requires less “magic” (I’m using the term loosely, there may very well be no actual magic at play here). This could very well be the beginning of something truly magnificent – and I absolutely loved Charles Soule on She-Hulk and have a lot of faith in him – but one issue is not enough for me to decide how I feel about this new direction. I’m happy to keep an open mind going forward. What about the merits of this particular issue? Well, I do think Soule really nails Matt’s voice and general behavior. Whatever else is new, this definitely feels like a Daredevil story. Matt may come across as exceedingly harsh when putting the pressure on a particular client, when compared to the somewhat gentler take on the character during Waid’s run, but this is not out of character in my book. Longtime readers will also recognize Matt’s dry wit, and Daredevil’s character-defining fearlessness. The fact that Matt sounds like Matt is a very good sign of things to come. 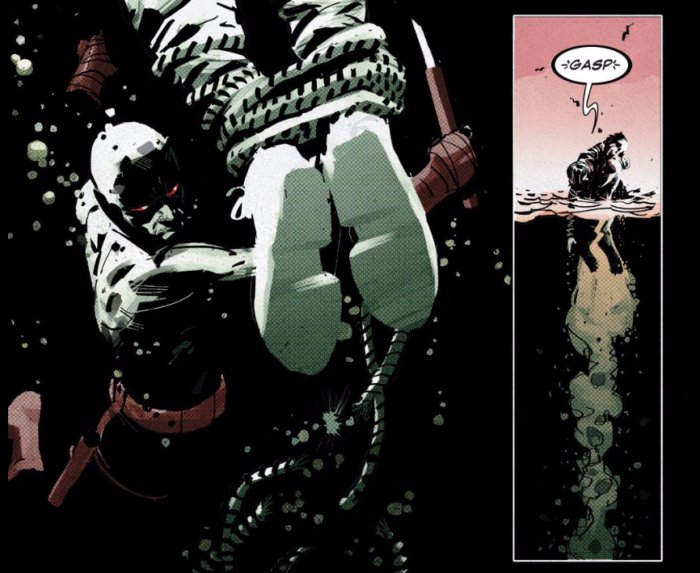 There is also nothing weird going on with Daredevil’s senses, which is always a big one for me. In fact, I think this aspect of the character is handled really well in this issue. The artwork is stellar overall, though I have a preference for Garney’s depiction of Daredevil in costume (see below) over his take on the civilian Matt Murdock. The third page, which shows Daredevil looking for Billy Li in the water is amazing to the point where I’d like to blow it up and hang it on the wall, and the details on the bridge on the opening page are mind-blowing. I’m a little confused by the coloring though. During the night time action scenes, at the beginning and end of the issue, the red hue seems like a stroke of genius on behalf of Matt Milla (a perfect name for a Daredevil colorist, by the way…), particularly over Garney’s distinctive linework. In a daytime office setting, however, it has the same effect as purposely marking a particular scene as having happened in the past, which I think creates some unnecessary distance between the reader and the characters on the page. Either way, it will be interesting to see both the art and writing evolve over time. With that, I’m going to round things off. This is a strong first issue, but for me, the jury is still out when it comes to the overall direction of this new series (volume 5!). Which is probably as it should be. I’m very interested to hear what you guys think though, so please put your thoughts in the comment section below! Where are you, Ms. McDuffie? We already miss you!! I’ve liked it, but I hope the don’t go the Mephisto way with the secret identity reboot. – The radar sense is only a distinctly coloured plain view. Some bidimensional details (the marks on Blindspot’s suit) were “seen” by Matt. Anyway, a solid issue. But are blind people so rare in the US that you don’t get to see them with their canes on the street? (in my country there is a lottery held by the National Association for the Blind, so you see them everyday at work in lottery booths). I don’t remember seeing such old-fashioned canes, even in my childhood… Only the long thin foldable ones. Matt’s characterization out of the costume didn’t feel right to me, but then again this is the first really noir take on DD I’ve read, since I haven’t gotten into the Bendis-Maleev or Brubaker stuff yet. I might have gotten too used to “fake it til you make it” Matt. I agree, solid issue writing and art-wise, but I’ll see how it goes. Best issue of Daredevil in a long time. Too long. Like welcoming home an old friend you didn’t truly realize how much you had missed. The art was just amazing. Garney is just at the top of his game. I am gonna miss the way Samnee and others illustrated Matt’s radar under Waid’s tenure, but I think we all expected a return to that “classic” style. I love the new look except for the flaming DD. Thats still a little much. I like the blade addition to his clubs and I hope he utilizes it more and more going forward. As good as the overall art was you could tell some of the “less exciting” panels with just Matt, Foggy, and or Li talking there was not as much time or detail put into. Writing was top notch. I’m excited to see how Matt works as a prosecutor and very curious as to the mystery of how his secret identity is back. Thats a reveal that could easily sink everything if not done right. The reveal at the end was a little sudden, but I have faith that not everything is as seems. Theo nay real flaw in the story I saw was for any who didn’t read the Point One that introduced Blindspot. In this first issue he’s just suddenly there as if they assume everyone read the aforementioned Point One. Soule has stated that he plans to have Kirsten show up at some point. Of course now she no longer knows Matt’s secret going by why Foggy says. I hope Soule uses her sparingly, giving her some closure, and then exits her from the book. Basically what Waid did with Milla. Hopefully Soule will introduce his own strong female character(s) into the book. Overall the issue was great; I like the direction and the creepy cult. I’m not sure where I stand on Blindspot just yet but I’ll give him a chance. By design or accident the tone was very, well, isolated is the best word I can come up with. Matt doesn’t seem to be a part of the extended universe or even the city for that matter. I do miss Waid’s smart writing, but this is a good reset. I don’t mind the blade in his club, but hope it can still double a vaulting pole. I know the physics are crazy, but it’s still fun. So far I don’t really like “Blindspot” or the idea of Matt having a sort of sidekick, in a way. He doesn’t seem like someone who would have a sidekick at all or really any companion, but whatever. I’ll try and give him a chance. Assuming the fact that Kristen McDuffie is gone is true, I’m very disappointed. I honestly loved Kristen and she ended up really growing on me as a now important addition to Matt’s story so after all the love hearing that she’s no longer part of the series is honestly kind of painful. I don’t like how this new “series” feels sort of rebooted, I would’ve liked at least a bit of continuation but that could be just me. The flaming DD I don’t really care for but it’s not entirely a big issue either. Same with the shorter cane. Don’t really like but can’t really complain because whatever. Don’t get me wrong – I love sort of noir takes on the character and Alex Maleev / Bendis was probably one of my favorite runs but so far I feel a bit disappointed. I’ll have to read this issue to see if my thoughts change on that but for the moment I’m not really feeling hyped. Kind of worried in a way. Matt’s my favorite character, I wouldn’t want this to go the wrong way lol. I feel like the idea behind the new costume is solid, but there’s something just off in its execution that makes me hate it. As Christine said, it looks really cool when covered in shadow, wrapped over a fantastic action pose. When he’s just standing there, though, he just looks… wrong. I think it’s just a little too black. Well, really, what throws me off is all the white shine on the black parts of the costume. I get that it’s stylized, but I feel like they should cut back on so much white area on his face and body. Darken him up some more. My head kind of automatically registers the black parts as a really dark red, so the white messes with me more than it should, but even forgetting that, the white shine seems excessive. In this way, I can get more with the cover art, than with what’s inside the book. In any case, I might like it more if the colours were swapped – red where it’s black and black where it’s red, eyes excluded – but that wouldn’t quite address why it looks so weird, to me. One of my problems is the slashy “DD” design. It looks like something I might have come up with in high school – it has a teenager’s sensibility of edginess that I don’t care for. Maybe I’m just too old to enjoy it, but it just comes off as corny. I do like the boxer boots and the wrap look of his arms. So, uh, there’s that.